Recently I was at a wedding as a guest not as the ‘official’ wedding photographer, but of course I couldn’t help noticing how he was working, or the equipment he was using. Me, I just went with my Leica Monochrom and a Summicron 35mm lens. As I noticed the equipment the wedding photographer was using, he noticed that I was using a Leica, and was most amused when I held up my iPhone to shoot some video. “It’s the first time I’ve every used it” says me – and it really was. I must confess that the quality wasn’t too bad, on a laptop monitor that is. I have to take my hat off – not that I was wearing one – to Daniel Morris the wedding photographer; there were so many enthusiast and amateur photographers at the wedding geeing for prime place to get their shots of the couple or standing next to him when group shots were being taken, and all along he just directed the couple and got on with his job. At times as a portrait photographer during a session I have often had family members come in and start taking their own photos, also as a PR photographer taking PR shots of MP’s their aids will stand next to me to take a shot on their mobiles to Tweet. These days this is part of being a professional photographer and is were one stands out – they’ll just ensure that they will get their shots no matter what in a polite, but ensuring way. Back to the featured photo. This was more-or-less a grab shot. 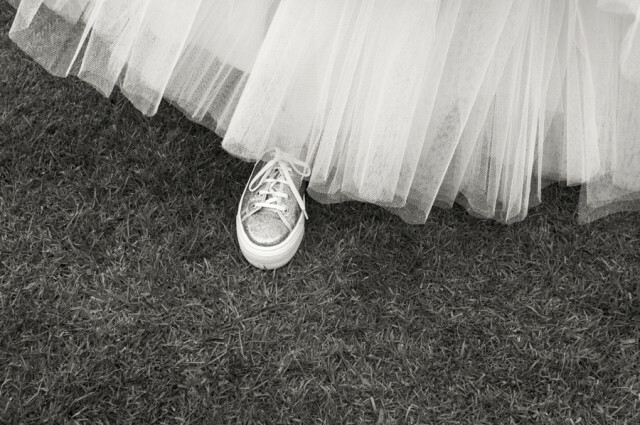 I noticed the bride was wearing silver pumps as her wedding shoes, this amused me. All very sensible for a someone who as often as not is wearing six inch high heels. The photo was taken with a Leica Monochrom and 35mm lens, F8 ISO 400 and processed in Lightroom 5. As I had to be quick I zoned focussed to take the shot. I’ll be writing a blog shortly on zone focusing using a Leica M, so watch this space. Many thanks for reading my musings, and enjoy what remains of the summer.